Great image from Daniel F. Pigatto via Flickr. 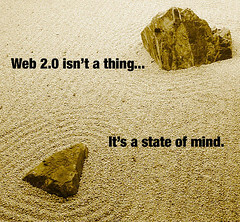 Funnily enough, I said in my recent Classroom 2.0 Live talk that, as far as I'm concerned, if it looks like Web 2.0 and behaves like Web 2.0 - ie facilitates collaboration and interaction, then it is Web 2.0. This image encapsulates my thinking exactly.